Levine Museum of the New South puts on one of the best cultural events each spring with its annual Taste of the New South. It's the museum's signature fundraiser, and the organizers come up with creative ideas to make it fresh and exciting each year. 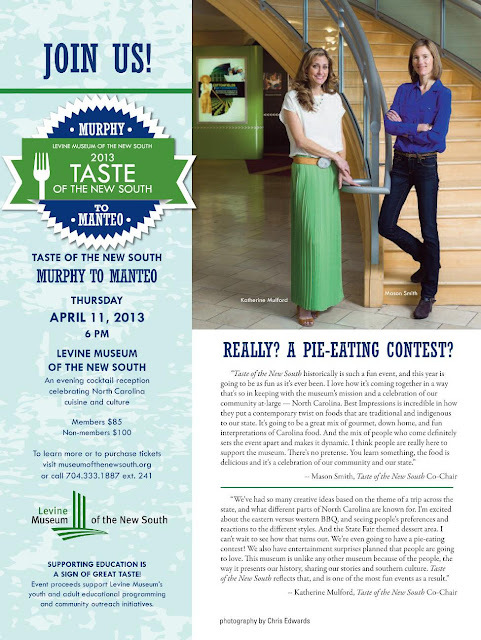 This year's Taste of the New South event is themed "Murphy to Manteo," and guests will be taken on a culinary and cultural trip across the state without leaving Charlotte, or the museum for that matter, when they visit on Thursday, April 11. First off, bring your appetite. In fact, on Thursday skip lunch. Working closely with the TOTNS planning committee, Best Impressions Caterers have put together an impressive and diverse menu for the evening. There'll be numerous hors d'oeuvres, such as Southern-style egg rolls, fried green tomatoes, and fried oysters; hefty servings of Eastern vs. Western North Carolina barbecue (guests will get to vote) paired with your favorite fixings like mac-n-cheese and hush puppies; a calabash station featuring fried flounder and jumbo crab cakes; and more. For your sweet tooth, there'll be a dessert station with popular items from the North Carolina State Fair, including fried apple hand pies, banana pudding shots, red velvet funnel cake, and Coca-Cola cake, to name a few. Games will accompany the state fair flair, and you can expect to find varying decor and activities (like a pie-eating contest and kissing booth) in each of the rooms throughout the museum to accentuate the menu items. Because you'll need something to wash down all of this great food, you'll enjoy an assortment of Southern tea and lemonade cocktails, along with local craft beer and wine. An eclectic mix of live entertainment is planned throughout the evening. 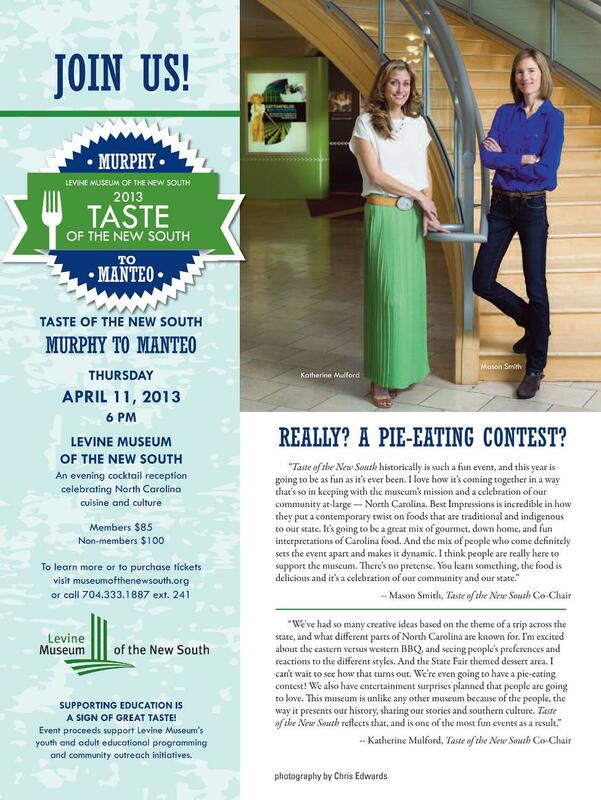 Taste of the New South truly is one of the most entertaining, belly-pleasing events you'll come across in Charlotte. The event begins at 6 p.m. on Thursday. Tickets to the event are $85 for Levine Museum members, $100 for nonmembers, and that includes all of the aforementioned food, drinks, and activities. You can buy tickets in advance at www.museumofthenewsouth.org. Great prizes will be raffled away--including weekend getaways, jewelry, and tickets to sporting events--and raffle tickets can be purchased for $25 each.